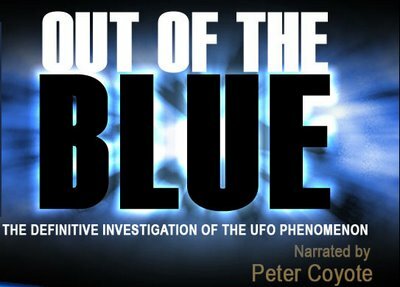 This movie is called "OUT OF THE BLUE" and is a feature-length, award-winning documentary on the UFO phenomenon. Narrated by Peter Coyote, he attempts to show through interviews with members of the scientific community, eye witnesses and high-ranking military and government personnel that some unidentified flying objects are of extraterrestrial origin and that secrecy and ridicule are used to hide the reality behind the subject of UFO's. This is another great documentary that is a good follow-up to my last post on the movie "I know What I saw". Although both movies share some of the same stories, it's just as fascinating never the less. To me this movie has loads of clad proof that the UFO phenomenon is not only real, but truly out of this world. I just don't see how the subject of UFO's can be denied. There are so many cases around the world that involve educated people who have professional careers. How can these stories be denied? How can that be shunned off as non-sense. Even Jimmy Carter, yes president Jimmy Carter has filed a UFO sighting. The was the president for crying out load! Enjoy.